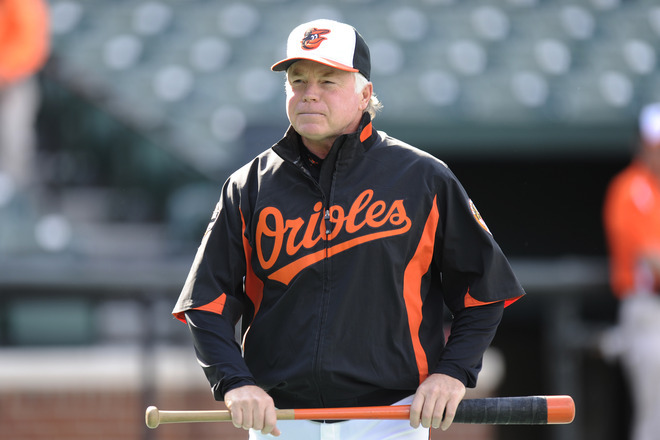 Orioles manager Buck Showalter is feeling pretty good these days and it's not because his club is wearing those awesome new hats but rather because his club has been the surprise team in the 2012 MLB season thus far. This is a team that was widely expected to finish in the cellar in what was considered to be a really tough American League East that sits right now in first place in their division and the second best record in the Junior Circuit. So is this just the byproduct of a fluky hot start or is this team a real contender? We knew the O's would be solid offensively, as they were last year. The club has suffered a little bit of a decline in batting average (.256 last year to .249 this year) and in on-base percentage (.316 to .311) but they have also improved in scoring runs (14th last year, 7th this year) and in slugging percentage (9th last year, 5th this year). Outfielder Adam Jones has built on the strong 2011 and has played great this year as he leads the team in homers with 10, fifth in the AL, batting average with a robust .291, RBIs in 21 and hits with 41. Matt Wieters has brought the bat again this year from behind the plate as he is hitting the ball really well plus doing a great job of getting on base. Shortstop J.J. Hardy is still bringing plenty of pop at what is normally an offensively deficient position. The real improvement on this roster has come with the pitching, something the O's have struggled with over the last several years. The staff has improved a lot in ERA (4.89 in 2011, 3.46 in 2012) and WHIP (1.45 in 2011, 1.25 in 2012) and a big reason for their improved pitching has been two acquisitions in the offseason in Jason Hammel and Wei-Yin Chen. Hammel, who was acquired from Colorado in the Jeremy Guthrie trade, has taken over the ace role as he has had his best year yet with a much lower ERA and WHIP than he has ever had plus he is also getting good run support and is working relatively deep into games. Chen, an import from Taiwan, has also been solid as he is 3-0 with a 2.68 ERA and a 1.27 WHIP. The bullpen has also greatly improved as Jim Johnson has really developed into a quality closer and Pedro Strop, who has been a very solid setup man. I'm not completely solid on whether or not this club is completely back because you know the Yankees are going to get rolling as we get into the summer, the Rays right now are just a game behind Baltimore, the Blue Jays are looking good and I would not count on the Red Sox just yet. I think that finishing .500 is a realistic goal and one that would be very pleasing in Baltimore and it speaks to how good of a manager Buck Showalter is, who Tom Verducci writes about how these big steps forward are a testament to the spring trainings he runs.